Wholesome, filling and delicious. 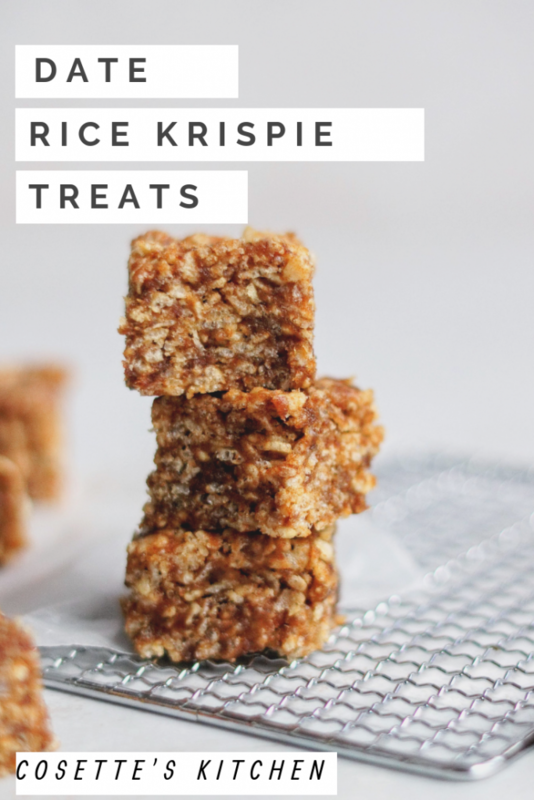 These Rice Krispie treats will be a hit with anyone. I know exactly what you’re thinking, why on Earth did you think it was a good idea to change a classic Rice Krispie treat? To be perfectly honest, I love rice krispie treats as much as my kids: sweet, gooey and almost so light and fluffy you forget how bad they are for you. I’m a firm believer of everything in moderation so we will ABSOLUTELY still make traditional rice krispie treats. But, these new treats will have you wishing for more. I’m pretty much obsessed with dates, they are sweet, filling and not to mention, good on the digestive system. They also happen to be a perfect natural sweetener, truly nature’s candy. Dates in Arabic is pronounced “Tammr”. Tammr is a natural filling for many Lebanese desserts including ma’mmoul or these easy and delicious date cookies. Dates are commonly found in the Middle East including Lebanon. These sweet pieces of nature’s candy are perfect alone or to create into a paste for easier use. Date paste is simply dates pitted, softened, blended and packaged. Using date paste in desserts is much easier and less time consuming than pitting and processing dates oneself. It seems only fitting to pair dates and tahini. Tahini, sesame paste is nutty, warm and rich. While tahini is traditionally used in many savory dishes like hummus, baba ganoush or garlicky sauces, it also has it’s place in sweets. Think of tahini like any nut butter and can truly replace a nut butter in a recipe for an allergy-free alternative. Not quite as overpowering as many nut butters, it is the perfect accompaniment to the very sweet date. Try and not to eat the whole tray! 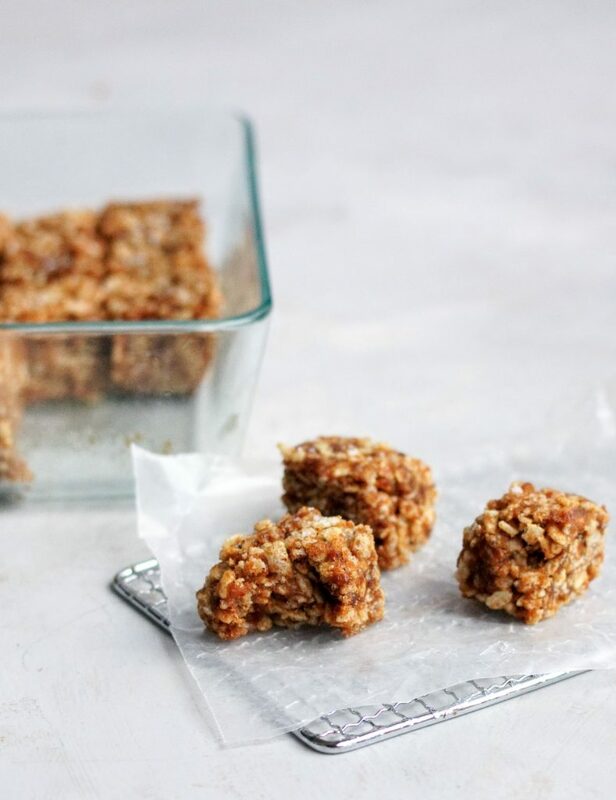 What better way to bring these two superfoods together in an easy to grab treat good for breakfast or snack anytime of day, rice krispies! Even though dates are sweet and tahini has characteristics of nut butters, sometimes kids are reluctant to eat either. I wanted to create a healthy, delicious and sweet treat I could give my kiddos and not feel guilty. 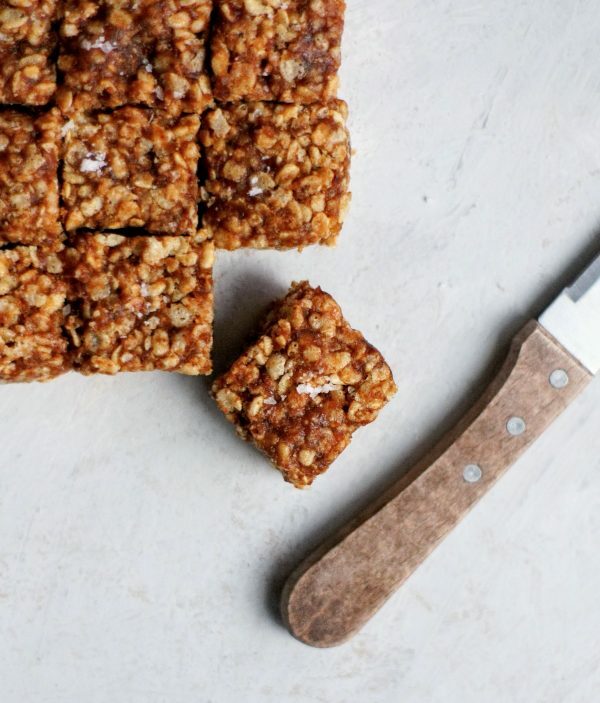 Something that will satisfy their sweet tooth but also fill their bellies with goodness. These would be a great lunchbox addition or to serve as a school snack. Not to mention my hubs and I love them! I can easily grab one and go in the morning with my coffee for a healthy and filling breakfast. I hope you enjoy this simple recipe, wholesome and delicious! As always, I love to see your creations be sure to tag me on Instagram or Facebook if you give this a try. Don’t forget to Pin for later, tap the “Pinterest” button on any image. I cut these into 20 small squares in my 9x7 pyrex glass dish. Smaller sized bites are perfect! Spray a 9x7 pan with cooking spray and set aside. In a large pot, add your date paste and coconut oil. Heat on low until the date paste begins to soften and melt. Add in your tahini and salt and continue melting until the mixture is combined and soft. Add in your cereal and fold into the date mixture using a spatula until all pieces are coated. Dump mixture into prepared pan and press down to flatten. Top with flake sea salt if desired. Cut and enjoy! Cover or place pieces in sealed container. Good for 3-5 days.